Sophia Contemporary is proud to present ‘Hunting the Light’, the gallery’s second presentation of paintings by the Iranian-American artist Reza Derakshani. 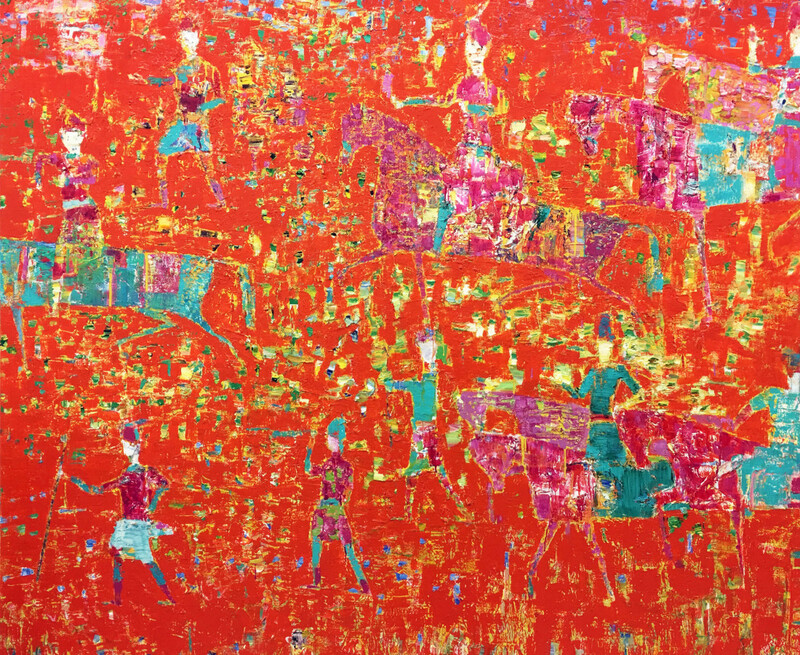 Following Sophia’s successful inaugural exhibition of his work in 2016, ‘Hunting the Light’ features twelve new paintings demonstrating Derakshani’s continued quest for a visual language that bridges Iranian artistic traditions with Western contemporary and abstract inclinations. On view from January 26 through March 10, 2018, the exhibition includes new works from three of Derakshani’s ongoing series: ‘Hunting,’ ‘Garden Party,’ and ‘Shirin and Khosrow.’ The new paintings in the series continue in the trademark vivid and expressive style of Derakshani’s earlier works, and are executed in oil on canvas. The ‘Hunting’ series refers to ancient Persian manuscript painting depicting hunting scenes in the Royal Court of the Iranian Shah. In what has become his signature technique, Derakshani abstracts these scenes and expands what was traditionally the subject of miniatures onto large canvases. The exhibition features four previously unseen works from this series. 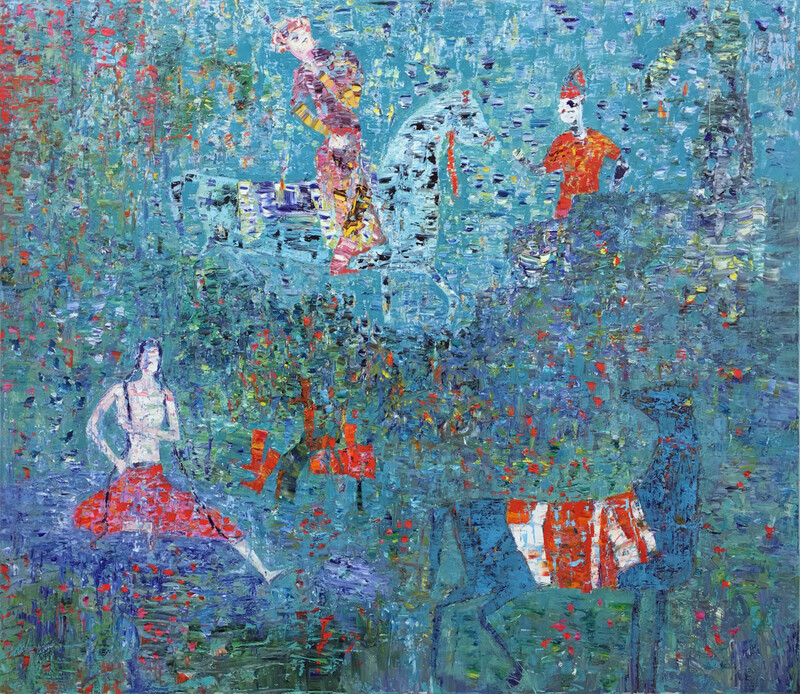 The ‘Garden Party’ series portrays traditional scenes of idyllic Persian gardens which are regarded in Persian culture as a metaphor for heaven and the afterlife. 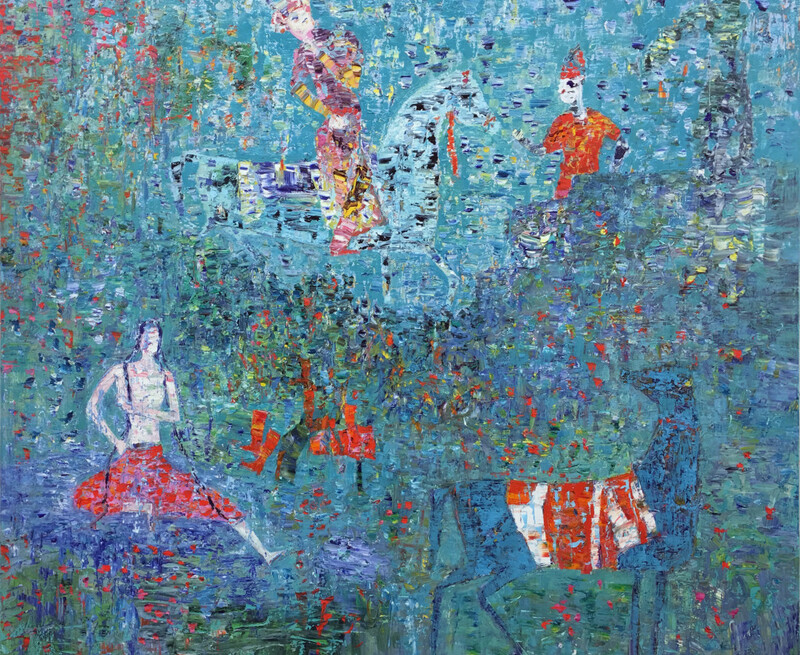 While garden parties are often pictured in Persian art, Derakshani’s dynamic brushstrokes reveal the influence of textured surfaces from Western abstract art movements. ‘Hunting the Light’ includes four new paintings from the ‘Garden Party’ series. Finally, the ‘Shirin and Khosrow’ series deals with the tragic romantic tale of two lovers featured in the Persian Shanameh (Book of Kings), Iran’s most important collection of tales and poems. This narrative, originally composed in the 10th century, is considered a major inspiration for Shakespeare’s ‘Romeo and Juliet.’ In the four new paintings from this series, Derakshani continues his investigation of this tale as an important source of creative influence for both Eastern and Western artistic practices. These three acclaimed series constitute the foundation of the artist’s practice and have constantly been conceptually and aesthetically reinvented and reinterpreted by the artist throughout his career. 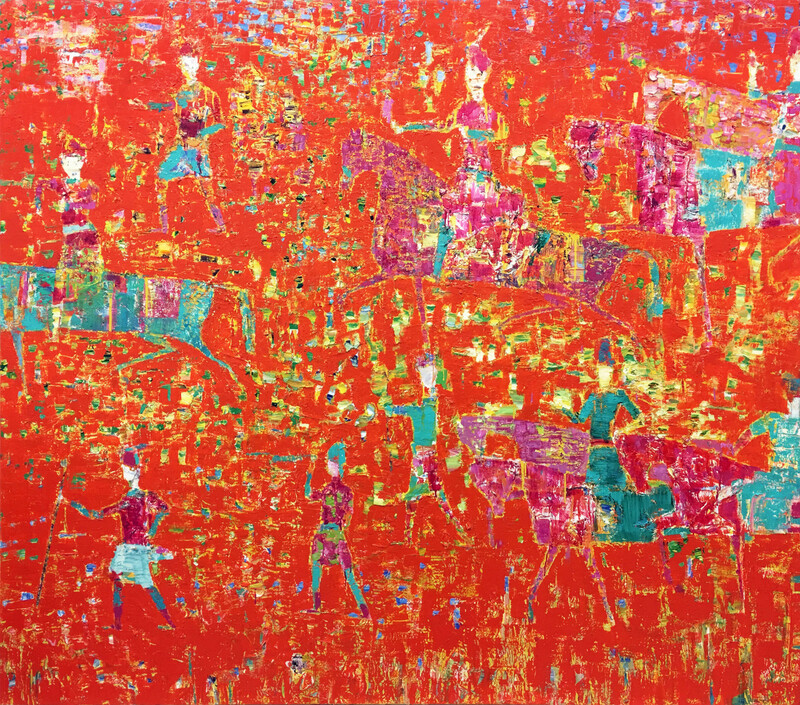 In these new works, Derakshani continues to fuse Eastern artistic traditions and contemporary art movements from the West, building an idiosyncratic oeuvre at the confluence of civilizations. Renowned for his bold and dynamic use of colour, the artist’s subject matter is reminiscent of the rich artistic traditions of Persian miniature painting and calligraphy, while the abstract use of vibrant colours reveals the artist’s spiritual inspiration grounded in the millenary tradition of Persian poetry. Derakshani became engrossed in Abstract Expressionism while living in New York and was soon associated with the revival of painting in the USA and Europe in the 1980s through the Neo-Expressionist style. While being loosely affiliated with the movement and active in New York artistic circles with fellow artists and friends Francesco Clemente, Shirin Neshat, Alessandro and Cy Twombly, the experience of emigration led Derakshani to reconnect with his Iranian roots. After experimenting with pure abstraction, the artist devised his personal artistic style blending abstract and figurative elements from both Eastern and Western cultures. This synthesis materialises beyond the visual impact of the works, notably in the socio-political themes that Derakshani explores. The paintings in this exhibition bring together nostalgic reflections on the history of the artist’s Iranian identity with contested notions of migration, displacement, and modernity. Reza Derakshani (b. 1952 in Sangsar, Iran) is an Iranian-American painter, poet, musician and performance artist. He is known both in the Middle East and in the West as one of the most important Middle Eastern artists. Derakshani graduated from the University of Tehran in 1976. He continued his studies at the Pasadena School of Art in California, and returned to Iran to teach at the University of Tehran and the School of Decorative Arts. He left Iran in 1983 following the Islamic Revolution and lived in New York for sixteen years. The artist subsequently moved to Italy before returning again to Iran for seven years. He now lives in Austin, USA, where in parallel to his career within visual arts, he collaborated with legendary musicians such as John Densmore, the drummer of the Doors, releasing two critically acclaimed albums. A young prodigy, he held his first solo show at the age of 19 at the Ghandriz Art Gallery in Tehran, going on to exhibit internationally. His work features in many public art collections including The British Museum, London; The Metropolitan Museum of Art, New York; The Russian Museum, St Petersburg, Russia and the Tehran Museum of Contemporary Art. Derakshani was the subject of a Retrospective exhibition at the Russian Museum in St Petersburg, Russia in 2016 as well as a solo show at the Kunstsammlungen Chemnitz in Germany the same year. In November 2017, Sotheby’s Hong Kong (in association with Sophia Contemporary and the Alfred Basbous Foundation) presented their first exhibition of Middle Eastern Art in Asia, titled “Two Moderns from the Middle East: Reza Derakshani and Alfred Basbous,” featuring works by both artists. Derakshani has also performed as a musician in numerous museums and festivals such as the Brooklyn Museum and the Montreux Jazz Festival.